does this family have a blog by any chance? I am totally smitten by their nursery! We always share a ton of link love when the person that we crash has a blog. Sadly Kristen doesn’t have one yet- but we did suggest that she jump on the bandwagon since she has so many awesome ideas! That lantern in the kitchen – amazing!! We’re planning a similar reno on our kitchen/dining room … opening up the wall and all. This gives me some great ideas! Thank you so much for sharing. 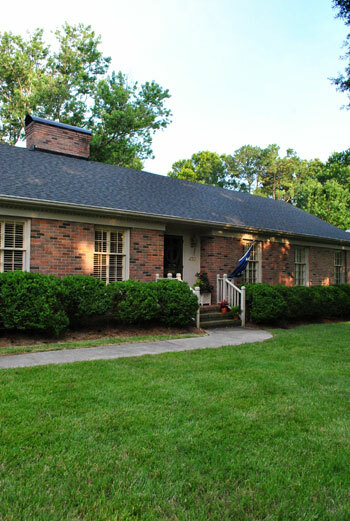 The before/after photos inspire me to come up with ideas for our house (it’s hard for me to think ‘out of the box’). Sherry, can you tell us where they moved the oven to during the renovation? I have a similar layout in my kitchen with a double oven on the end of a wall that I would like to blow out and I would love some ideas on a new location for the oven. The oven became a stove that you can see behind the island in that peninsula that connects to the family room. See the range hood over it? Hope it helps! Oh my goodness it all looks so great! I especially love how the kitchen turned out! Love that blue chair. And the cute baby, but I suppose I can’t take either. This house is so cute and inviting! I would love to know where she got the end tables that she uses at each end of their sofa- they’re exactly what we’re looking for to use as nightstands! Hi Laura! Thank you so much for your sweet comments. The end tables were a lucky hand-me-down from Stan’s grandmother Betty. We were so grateful for them as we had been hunting for just the right thing beside the couch. Contemplated putting a sofa table behind the couch and putting the lamps there too but we love those tables too much to put them somewhere else! I have a quick question…what type of high gloss paint did she use on that table? I have some things I want to paint, but I really want them to end up glossy…and nothing seems to really give me the look I want. She used regular spray paint followed by a high gloss lacquer spray (you can find it at Lowe’s or Home Depot in the spray painting aisle). just be sure to apply thin and even coats with drying time between (as opposed to one thick drippy one). I love how Kristen “addressed the elephant in the room” subtley and tastefully. She is obviously up on all the new decorating trends – LOL! DIY-able should totally be in the dictionary. And I love that the Elephant in the Room is going to be picked up on now because all us YHL readers are talking about it. Here’s hoping it will end up as an SNL sketch! 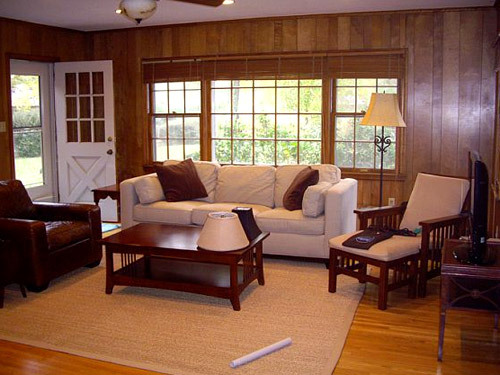 What an awesome living room transformation! 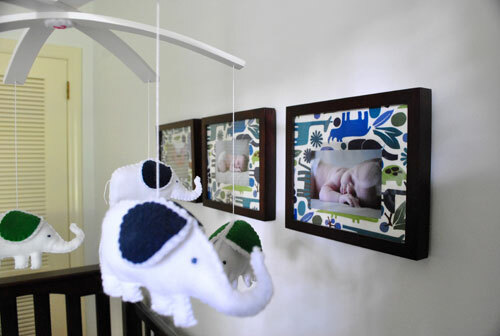 Thanks for sharing the nursery ideas- DIY safari canvases are a great idea! Okay, maybe I’m just an idiot and I’ll take that title, but I do NOT understand where the wires to all these table lamps go! When you have a lamp on a table away from the wall, where is the wire to plug it in? Are people buying lamps operated by batteries that I don’t know about?? I have a lamp by my couch but my couch is a couple feet from the wall and the wire just sits along the carpet all the way from the outlet to the lamp. I don’t trip on it, but it’s unsightly! HELP! Sometimes people add floor outlets next to their sofa if it’s floating. It only costs $100 or so if you get a bunch of estimates and it can really make a room functional and keep people from tripping. Here’s hoping Kristen can drop in to clarify what she did for those lamps! We struggled with that too Rachel! I always marvel at the TVs/DVRs sans wires in magazines too! Sherry is right–we are in the process of moving our outlets to underneath the sofa (which is more baby-safe to have them hidden completely and will look better overall) But in the meantime we used extension cords to get them to the wall, which thankfully isn’t too far away, and then put a heavy runner down over them to cover them and so our son wouldn’t trip on them. It’s nice too bc our window treatments are so large they cover the outlets and walls where they plug in so you can’t see them. Man you’re sly! I had no idea. Haha! Thanks! Come on down to Charlotte. Davis would love a companion! i found myself nodding (not “nodding off”, to clarify) when reading all your comments, sherry – love all these amazing improvements! 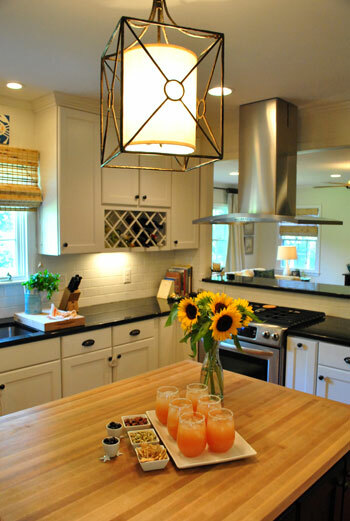 that kitchen light fixture is stunning! and i wholeheartedly agree with your bridesmaids comments… loved it! but i kinda preferred kristin wiig’s wardrobe. great post! woah – far too many exclamation marks… i’ll try and tone it down a notch. Haha, I’m the same way!!!!!!! I am absolutely in love with the artwork in the nursery. After seeing it, I’ve decided to DIY some of my own canvases for our baby girl’s room. While I’ve seen lots of cute wood and canvas pieces that I like out there, I think creating something will be that much more special. Plus, it allows me to add the green, pink and chocolate colors I’m currently loving for her space. Gorgeous! I wish my “after” pictures looked half as stunning! PS: You’re missing your second parenthesis under the first before pic. Thanks! Off to fix it! That house is awesome! 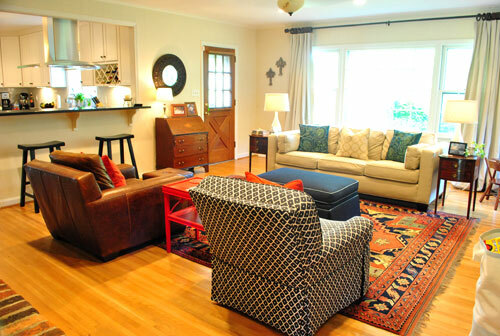 What an amazing kitchen remodel and the family room is so warm and inviting with all its layers and colors! And what an absolutely adorable nursery! LOVE the blue and green and animal prints!!! Love the kitchen! I have been wavering between off white or white for the kitchen cabinets, but this sold me on the white! I also love the silhouette prints in the nursery. I’m not much of a painter, so I may just cut out silhouette out of coloured paper and frame it, but it is PERFECT! I love the blue and white chair in the living room! 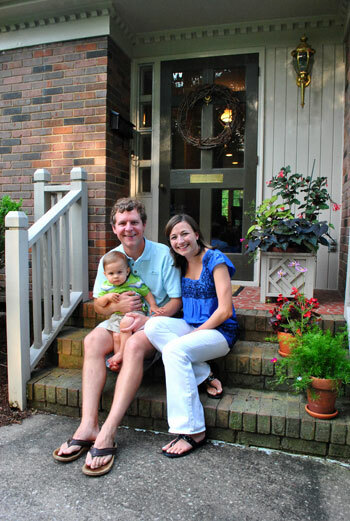 What a great looking house…very homey feeling! 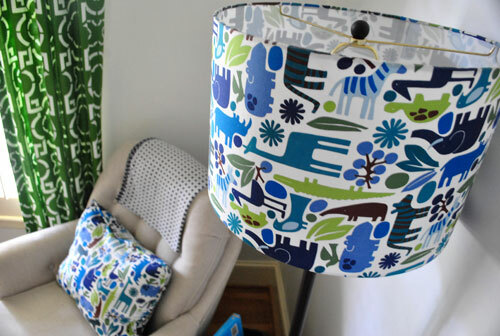 LOVE the teeny tiny zoo print! someone bought me burp cloths when my son was born and i WANTED to find the print so badly so i could DIY a few burp cloths or other stuff. THANKS for posting where to find!! 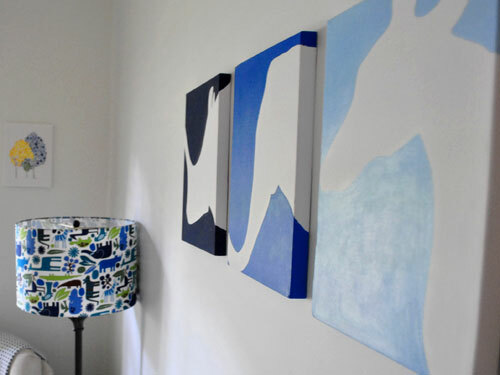 So funnny… I painted that same art work for my son’s nursery last year. WOW ! 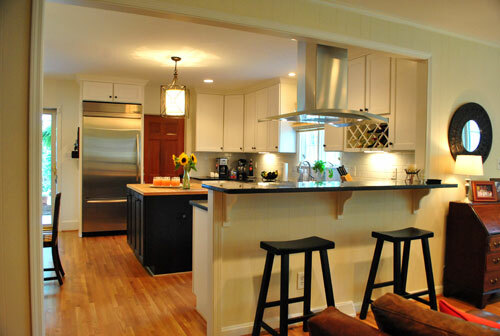 That reno sure looks like the ‘open the wall’ between your dining/kitchen plan. Nice to see how someone else worked it out. i also have a bit of stove envy. Hopefully Kristen will drop in with that info! Thank you too about the stove. It has certainly encouraged my love of cooking! Enjoyed the tour. Amazing changes. love the kitchen! we’re getting ready to start a kitchen reno, so i was wondering if you could tell me what appliances you went with? do you like them? we’re shopping for ours now, and there are a lot of options out there! thanks! Here’s hoping Kristen can stop in with that info for ya soon! Hi Nicole! Thank you and good luck with your reno. It is so worth it once it’s all done! The toughest part for me was when we were without a sink so be sure they do that at the very end. Otherwise it’s amazing what you can do with a microwave and grill ;) Anyway we love our appliances and did a lot of shopping around to get the best deals on what we wanted. We went with Kitchenaid dishwasher (model KUDC20CVSS3) and Ktichenaid 30″ slide in gas range along with a GE profile 36″ Island hood. Hope that helps! Can I just say that with all of the awesome house things, I am most impressed by the fact that there is sugar on the rims of the drinks!! And those fabric matted pics in the nursery?? I die. What a wonderful renovation. I love the kitchen, especially that vent hood. Looking at it from the living room, it’s almost like a piece of sculpture. I also really like those rustic wooden doors that are visible from the kitchen. 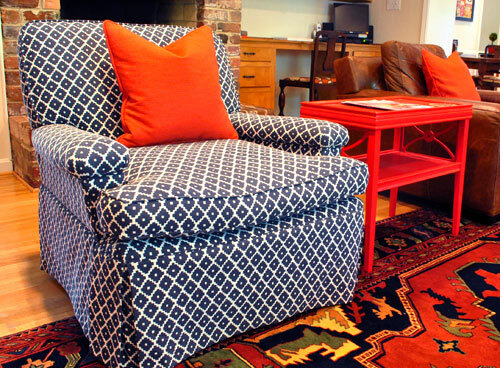 The blend of modern, traditional and rustic all works together beautifully. Cute cute house! And I secretly wanted to go watch Bridesmaids with my husband. He said no other men go to watch that movie. I can now tell him otherwise! Thanks! If it helps, tell him it’s a Judd Apatow movie (the same guy who did Knocked Up and Superbad) and definitely felt like one of his films. There was even a scene that even grossed me out so much I had to look away (watching others vomit – even fake vomit – is not my thing). My husband and my two brothers went to see Bridesmaids with me. They all loved it and thought it was hilarious! I love their nursery so hard it’s not even funny. I loved Bridesmaids too! I thought it was hilarious but also thought Kristen Wiig brought some heart to the story. Seriously though, I had that Wilson Phillips song stuck in my head for weeks! I turned to my friend after the movie and told her I wished they had performed at my wedding. wow I love this “after” — is there a table by the back door in the kitchen? I see a chair in the pic. This is exactly the reno on my pipe dream list! Yup, there’s a small table with a few chairs against that wall. So sorry we couldn’t get more of that in the pic! Maybe it’s just this particular picture, but Stan looks like David Letterman some years ago…..
Love the kitchen open, the house now looks like a totally different era (a’ka up to the minute fresh). That’s so funny! You’re the second person to say Stan looks like a celebrity! Someone else said Michael Cera. Oh my gosh this is so funny. The celeb look-a-like comments have been just as fun for us to read as the house ones; ) There’s a curly headed comedian theme going on. Young Letterman and older Michael Cera are new ones for sure–it may be the picture. He’s gotten a young George W Bush and also Bobby Flay before too which cracks us up. Too funny! Haha, gotta love that range! that nursery is too cute!! love her home, very good ideas. i actually want to put up paneling and paint it white for a beachy feel! Hi Kelly-was reading back through answering some posts (very late responses unfortunately!) and saw your comment. A good friend of mine Elizabeth Newman is a designer in Charleston SC, and she hangs wide wood paneling in kitchens horizontally as opposed to vertically then paints it almost like a white-wash. It is completely drool-worthy and gives an instant “beach” feel. If you’re still thinking about doing that I hope that helps! That kitchen is FANTASTIC! We are redoing ours soon and I’m collecting inspiration from this! LOVE LOVE LOVE what they did! 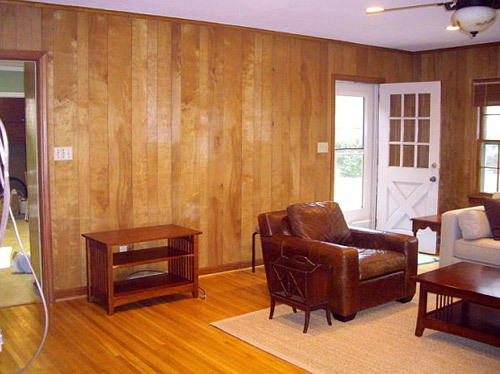 We are in the process of buying a home from the 1960s with wood paneling GALORE, so I’ve been googling “before & afters” of painted wood paneling. So fun to see the transformations! Thanks for your awesome tutorials. It appears the little white cups on the island (holding the chocolate) have feet. Am I seeing things? Could you ask Kristen where she purchased these? They are precious. They must be mine. Yes, they had little feet! Here’s hoping Kristen stops by with that info. I think I’ve seen some at Crate & Barrel if that helps in the meantime! Haha- now I’m into elephants! I can’t help myself! LOVE the kitchen!!! Gorgeous!!! Thanks for sharing John & Sherry!!! I totally noticed Kristin Wiig’s heart earrings too! Wonderful! This must make you guys really antsy to start on your own kitchen! 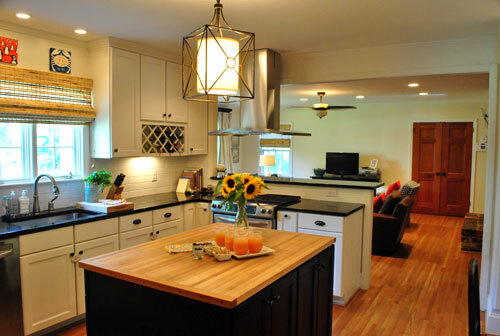 Love the kitchen redo!!! But what I want to know about is that Yummy lookin grapefruit drink?? It look delish….what’s the recipe?? Here’s hoping Kristen will post the recipe! John and I had virgin ones and it was still delicious! Hi Lisa! 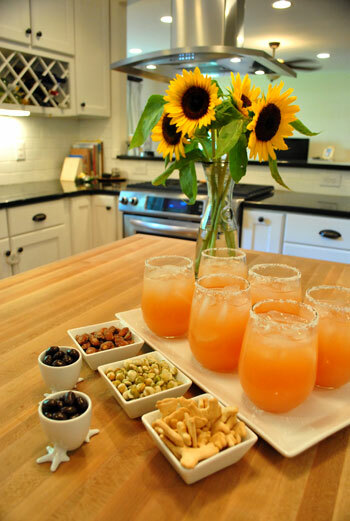 Cold beverages in the hot South are a must ;) These are called Salty Dogs and we made them with Ruby Red Grapefruit juice and vodka shaken and poured over ice with a salt rimmed glass. They are good without alcohol too and still look just as pretty! The kitchen turned out great– esp. the countertops. What did you use? 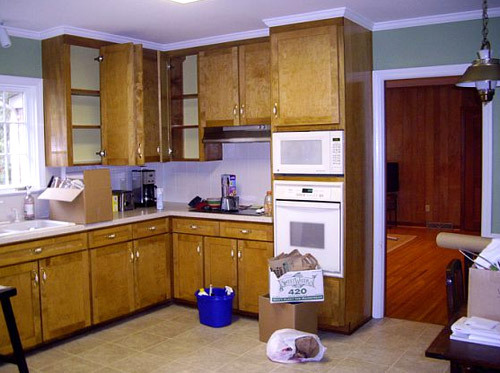 Are the cabinets new as well or refinished? I believe they went with black granite and new cabinets since they had to configure the whole room and couldn’t use the original cabs. Here’s hoping Kristen stops in with more info for ya! Gorgeous house! It leaves me in a quandary about my wood floors and I wonder if you could weigh in. I see they carried the same color wood from the family room into the living room and I know you refinished all your rooms in the last house to match the new, darker wood. I need new wood on the first floor but my upstairs is quite fine — albeit the same kind of orangey wood in this house (and similar to what you had in the last). I want to go dark downstairs, but then I would want to carry the dark all the way upstairs and into rooms that don’t really “need” it. 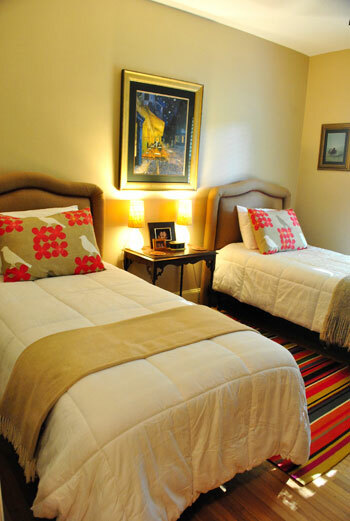 Did your other rooms “need” refinishing, or did you do it just because you enjoyed the darker color? Thanks for any advice. Hopefully Kristen will drop by with her opinion! Thanks, Sherry…I was kinda looking for your opinion since you redid all of yours in the last house. But Kristen’s opinion is welcomed!